A survey by Ancestry.com found that 33% of Americans can’t name all 4 of their Grandparents. - However most Millennials say they came name “All 3” of their Parents. Dozens of top Democrat Congress members are taking heat for flying to Puerto Rico to party with lobbyists 3 weeks into the Government Shutdown. 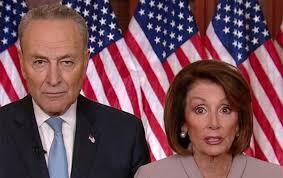 - To be fair… When Chuck and Nancy were on TV giving their rebuttal to Trump last week, they looked like they could USE a vacation. Or at least a LAXATIVE. Prez Trump has a new name for Amazon Adulterer Jeff Bezos… who owns the anti-Trump “Washington Post”… tweeting how sorry he is for “Jeff BOZO” and his impending divorce. Kardashian sister Kylie Jenner has been dethroned as the “Most Liked” image on Instagram… by a picture of an Egg. Kylie has 17 million likes… the Egg got 28 Million. - Proving once again that fame isn’t all it’s cracked up to be. The first NFL Playoff game officiated by a Woman took place yesterday between the Patriots and the Chargers. - Instead of Throwing a Flag on a play she “Tweeted the Penalty” with the Hashtag #illegaluseofhands. Thousands of people from New York City to Berlin donned socks, shoes and not much else for the annual “No Pants Subway Ride” over the weekend. - Talk about Brave! Most people are afraid to sit on subway seats with their pants ON.